Hudson – In the few years since moving from New Hampshire to Massachusetts, Maya Levine has already made her mark in Hudson High School’s theater productions, particularly in comedic roles. 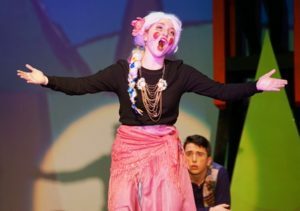 Her acting abilities have left a great impression on the school’s theater director, Kathleen McKenzie. During the fall of 2015, Levine’s start to her freshman year proved to be rather difficult as a new student in school. Levine had experience acting in school and community theatre and felt that would be a good way to make friends and fit in. She auditioned and was cast in the eighth- and ninth-grade show, “Anne of Green Gables.” Ever since then she has been part of almost every theater production at Hudson High School and has found great friendships with classmates along the way. Levine is now a junior and has been incredibly productive on stage. She has taken Drama I and II, performing in various roles, and was also able to work backstage in plays to learn what goes on behind the scenes. But Maya’s activities in theater have extended well beyond that. From March 9-11, Hudson High School performed the musical “Bye Bye Birdie,” in which Levine played Mrs. MacAfee. With the remainder of her theatre career at Hudson High there is no doubt that she will continue exhilarating audience members on stage.